The adult services within Bannatyne house are on a Monday and Wednesday, the arts & crafts on Mondays is delivered in partnership with silver deal and is attended by residents of Clinton House care home. They do a number of different activities including glass painting, flowerpots, drawing etc. This is normally finished off a cup of tea and a friendly game of dominos or cards. The Wednesday adult activities group runs once a week in Bannatyne House this group aims to reduce social isolation. This group takes part in different activitys each week are things like arts and crafts, knitting, bingo, and dominos. As well as this, they attend outings to places like the barge with the seagulls trust, tea dance, and out to restaurants for some lunch. 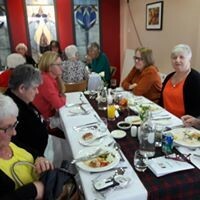 Throughout the year this group meets up with the other adult groups FARE provide for fundraising nights, bingo, and Christmas lunch so sharing stories and experiences with the wider community. FARE provide a variety of services in the Blairtummock area of Easterhouse. 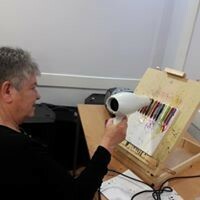 Our adult provision includes exercise classes where adults participate in exercises that support their ability such as chair yoga and chair Zumba as well as adult arts & crafts classes where our service users enjoy activities such as painting, drawing, sewing and wool craft, as well as a monthly game of bingo. We also deliver adult cooking sessions where participants prepare and cook a meal and enjoy a few games of dominos and a chat after their lunch. The focus of our adult sessions are to prevent social isolation and maintain health and wellbeing, particularly amongst our elderly residents, and so each activity includes the opportunity for participants to have a chat over a cup of tea or coffee. We have also established links with the Wellpark adult group and meet up once a month to enjoy a game of bingo and a catch up. 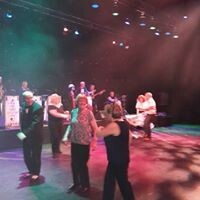 Our adults have also enjoyed various trips in the last year including seaside outings to Largs and Helensburgh, barge trips, afternoon tea, a tour of the River City set, bowling, a trip to Blackpool and set and a tea dance with a live swing band. We also carry out 9 home visits per week to assist vulnerable adults and families in the Blairtummock community with things such as attending appointments, collecting prescriptions, food shopping, transporting to clubs and to provide company at home. Wellpark adult group meets every Wednesday and Friday. 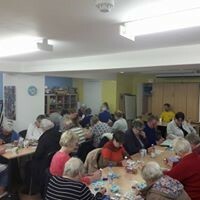 The group enjoy weekly bingo sessions and very similar to the adult services delivered in other areas it reduces isolation within the older adults within the local community. 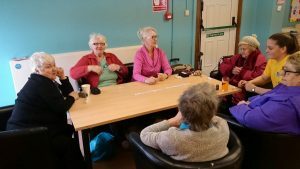 The group also enjoy knittng, easy exercise sessions, arts and crafts, knitting, bingo, baking, board games and dominoes. 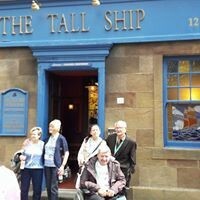 The programme allows the adults to participate in various trips including tea dances, seaside visits, barge trips and also had Christmas lunch in FARE and at the Tennents Brewery in Wellpark. In addition to these adult services FARE staff also carry out home visits aimed at vulnerable or isolated adults who require some extra support. These take place over all areas that adult provision takes place. Visits take place and the support required on these visits varies from case to case, often including having a friendly chat with another adult, going on shopping trips for individuals unable to leave their homes and also linking in with other agencies when specialised help is required. Through the home visits, we aim to reduce isolation, reconnect people to services and the community and, where possible, integrate them into our activity programme.